The Trudeau government's proposals include restrictions on the colour of packaging and the depiction of branding, requirements for mandatory warning labels and a ban on packaging designed to appeal to young people. 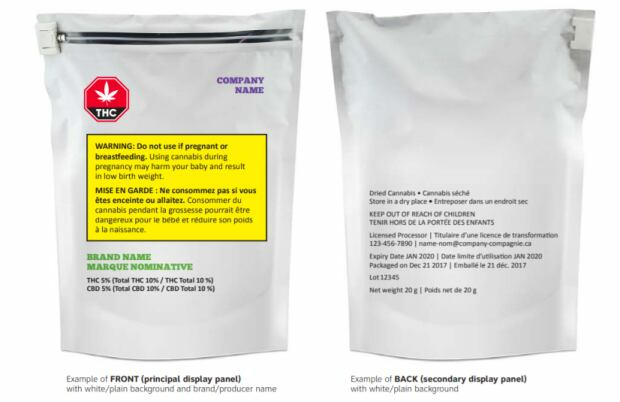 The regulations state cannabis packaging can't display florescent or metallic colours and the colours that are used must contrast with those of the official cannabis symbol — meant to warn the consumer about the presence of marijuana's active ingredients — and the yellow background of the Health Canada warnings. The proposed restrictions also stipulate that only one additional branding element – aside from the brand name itself – can be displayed on the tamper-proof and child-proof packaging. 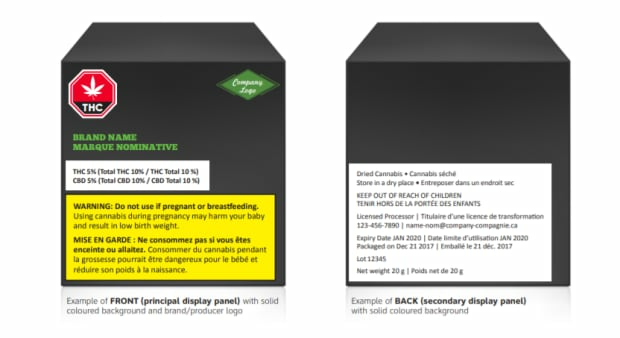 If that additional element is a slogan, the lettering can't be bigger than the font of the health warning, while any logo must be the same size as, or smaller than, the standardized cannabis symbol. 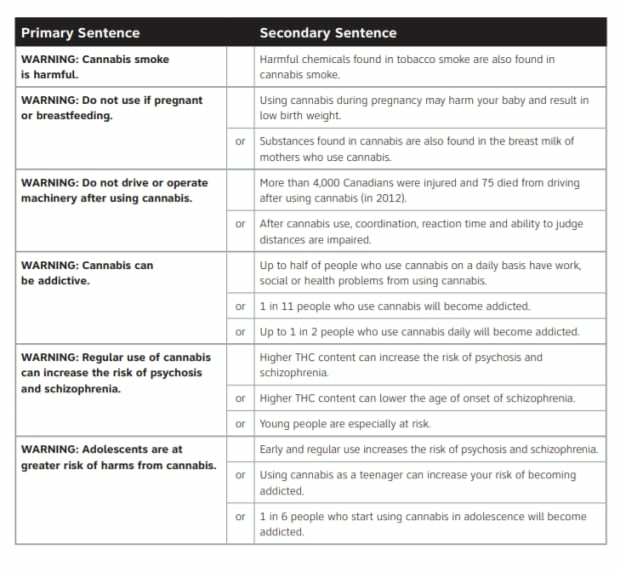 The proposed regulations — which could still change as the Cannabis Act works its way though Parliament — require producers to include one of 14 mandatory health warnings on each package. Producers and/or cultivators would be required to make sure all messages appear on their products by rotating the various warnings "on each package of each brand name with equal frequency in a calendar year." "We have heard loud and clear from provinces and territories and also from stakeholders that they need to have this information regarding packaging as soon as possible," said Petitpas Taylor. "So we are very comfortable with the information that has been brought forward with respect to the specifics of the labelling and the packaging and the warning sign that is going to be on all cannabis types of products." "We also want to ensure that consumers are aware of the THC and the CBD levels that will be included in the cannabis product that they may choose to purchase. That's the type of information that we feel is very, very important to Canadians," said Petitpas Taylor. A micro-cultivator — someone growing pot on a small, boutique-like scale — would be restricted to a "plant canopy area" of no more than 200 square meters. 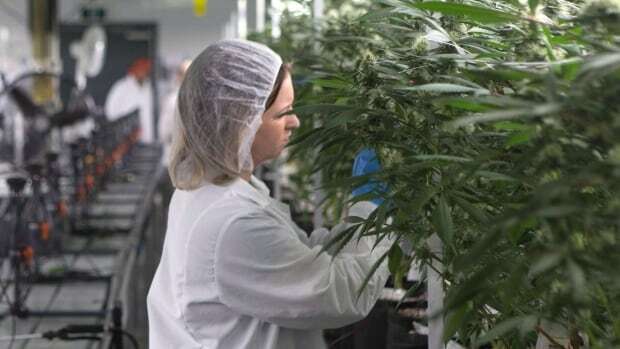 The micro-cultivation and processing limits, Health Canada said, were set to allow "small-scale growers and processors in the legal cannabis industry" to make their businesses viable without making them so small that the rules would drive producers into the black market to survive. "It's just really going to limit the scale that the micro-producers can contribute to the marketplace," said Robinson. "Micro-producers represent the folks who have built this industry. They are no-doubt the producers of the highest quality." In all, the federal government's consultations received 3,218 online responses and 450 written submissions. Health Canada also saw 192 "interested parties" participate in roundtables and another 343 take part in online webinars. Many of the respondents suggested that because there are currently thousands of different strains of cannabis being sold in Canada illegally, that to remain competitive legal growers would need access to plant genetics to expand their offering. The government responded by saying that "consideration is being given to how the regulations could enable the introduction of new plant genetics into the legal system."